Moonwalking is all over the news at the moment, as we approach the fortieth anniversary of the first humans to walk on the surface of the moon in the Apollo 11 mission. 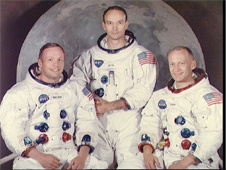 On the 16th July 1969, Neil Armstrong, Buzz Aldrin and Michael Collins blasted off for the moon. On the 20th, Armstrong and Aldrin set foot on the surface of the moon: a massive landmark in science, adventure and international TV broadcasting. You’ve got to feel a bit sorry for Collins though – driving all that way just to stay in the car. The NASA website has loads of great resources about the moon landing and the Apollo missions, so head on over there and check them out (including some cool First Footprints teaching resources). It’s amazing to think of what was achieved with such limited computing power, and it really was a turning point in science (and science fiction was never the same afterward). Of course, any talk of the moonlandings brings out the crazies (which is why comments are disabled on this post), so here are a couple of other nice clips. And of course who better to set it to rights than the Mythbusters? Posted on July 6, 2009, in Mythbusters, YouTube and tagged apollo 11, moon landing. Bookmark the permalink. Comments Off on Moonwalking: 40 Years On.